7 real ales were on offer last night. I had a superb pint of Rebellion IPA but there was a real ale for every taste. Sat in the garden and enjoyed the sunset at this hidden rural gem. A deserved winner of Herts CAMRA gold awards. My favourite boozer in the county. The Woodman is thriving, 4 casks on and several fizz. Monday afternoon was busy. Fair prices and lots of locals plus day trippers. Simples. but works. Tried the Buntingford Polar Star on Saturday and it was lovely. Normally seem to have a good range of beers in here. To please the non-real ale drinkers there are three lagers, guinness and a cider on tap, plus the usual selection of wines. There is a lunchtime food service and the woodman closes in the afternoons as per old licensing hours. Another village to aspire to live in!! 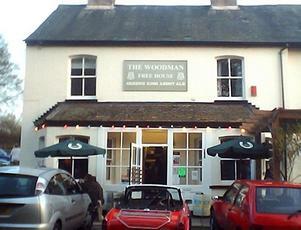 I searched out the Woodman on the net prior to travelling down from the Midlands...glad I did. I had read somewhere the words "Cracking Little Boozer" and it sure was. Three pints all in excellent condition, started off with Buntingford "June" floral and hoppy, very refreshing on a warm evening, then Crouch Vale "Yakima Gold" again excellent, nice head, slightly off white with a nice hoppy-citrussy kick and finished off with Adnams "Broadside" super condition, malty toffee flavours with a head that followed the beer all the way down the glass. Friendly locals, knowledgable staff and a great environment..I hope I get asked to go down South on business again as I will definitely add this to my list of favourites, and congrats to all concerned on winning South Herts Pub of the Year.